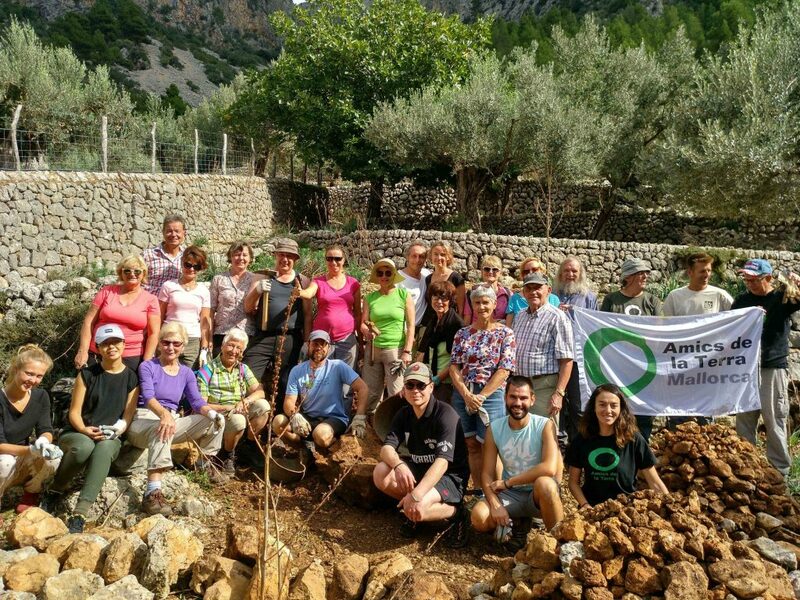 Last weekend, around 30 people (German tourists and locals) took part in a novel volunteering day organised by Amics de la Terra Mallorca to help recover olive groves and dry-stone walls in the Serra de Tramuntana, thereby raising hiking tourists’ awareness of the importance of maintaining them and the challenges in protecting a UNESCO World Heritage site. The volunteering day, which will be repeated several times in 2018, was carried out in partnership with BUND (Friends of the Earth Germany) and is part of a larger project supported by the German state foundation DBU. In addition to volunteering days for tourists, this project includes mountain guide training funded by the Consell de Mallorca, a survey of German hikers on why they visit the Tramuntana, as well as an online directory of places to buy local Tramuntana products in order to promote their sale. The volunteering days aim to offer German walkers visiting the Tramuntana the chance to actively take part in protecting it. Twenty German tourists and 10 Amics de la Terra Mallorca volunteers started the day with a hike up the Barranc de Biniaraix to Can Silles, where the working day was carried out. Participants learnt how to make a terrace wall (‘marge‘) and helped a professional ‘marger‘ to rebuild one, realising how much hard, skilled work is required. They also helped to tidy up various olive grove terraces, removing reed grass and invasive pine trees. Gori from Can Silles showed attendees how to graft an olive tree to avoid it becoming out-of-control. After a few hours’ work, they tried a delicious ‘arròs brut‘ (a Mallorcan rice dish) and other local products, before descending the Barranc. In the afternoon, they visited the Capvespre Centre in Sóller to find out about the different types of olives and oils, and could see first hand how olive oil is produced using the co-operative’s press. The day was a complete success. The tourists were delighted to find out more about the Serra de Tramuntana’s unique landscape as shaped by man, as well as the huge challenges in maintaining it. They were very happy to have the chance to do their bit to help through volunteer work, as well as to meet local people. The next volunteering days will take place in spring 2018 when the hiking tourism season begins again. Friends of the Earth Spain groups paint various collective murals to call for energy and climate justice. 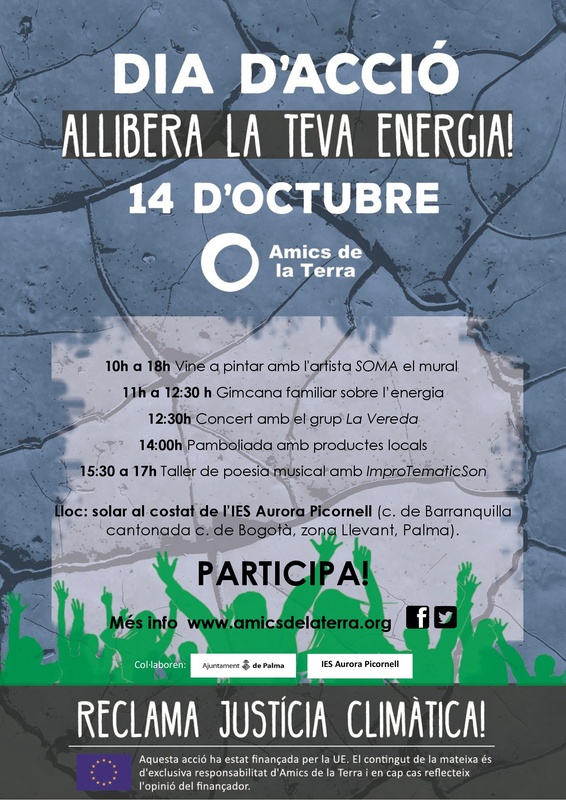 Amics de la Terra Mallorca highlights the island’s energy model based on burning coal to produce electricity, widespread use of cars, planes and cruise ships, and oil prospecting threatening our coasts. Take a look at photos from Amics de la Terra Mallorca’s Global Day of Action. On 14 October 2017, thousands of Friends of the Earth activists took part in the Global Day of Action for Energy and Climate Justice in more than 30 countries across 6 continents. In Spain, local groups organised actions spread out across each region with a central activity common to all groups. Activists painted a collective mural to speak out about big energy companies on their human rights abuses and responsibility in the face of climate change. In Mallorca, around 20 Friends of the Earth activists carried out various activities alongside the collective mural painting with artist SOMA, with an energy game with renewable superheroes, a concert with group La Vereda and an improvised musical poetry workshop with attendees’ messages. With the mural painted on a wall at the Aurora Picornell secondary school in the Nou Llevant neighbourhood, Amics de la Terra Mallorca highlighted the island’s energy model based on burning coal to produce electricity, widespread use of cars, planes and cruise ships, and oil prospecting’s threat to our coasts. Mobilisations for energy and climate justice spread across the world this weekend. In Japan and Indonesia, activists went onto the streets to demand the end of coal; in Mozambique, communities affected by gas projects joined the Day of Action; and in the UK, people protested with giant dinosaurs against fracking. 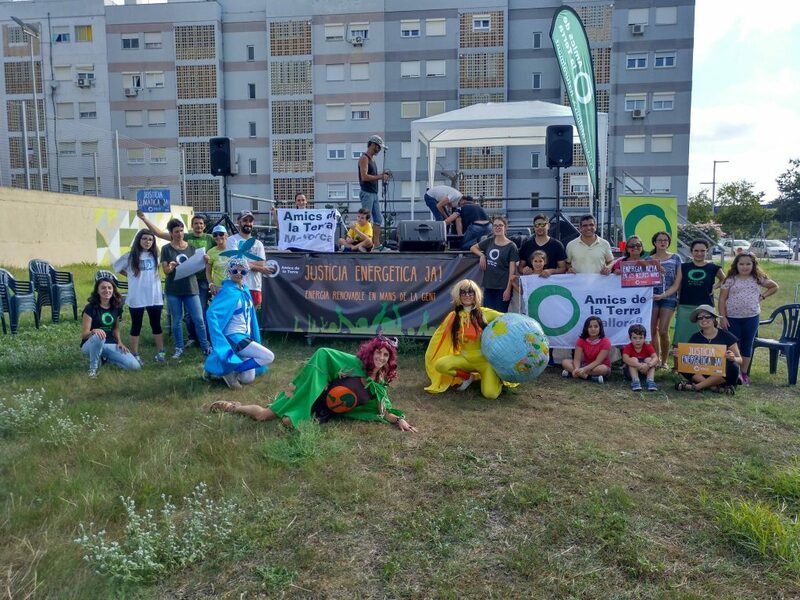 In Spain, local groups from Andalusia, Aragon, Ibiza, Galicia, La Rioja, Mallorca and Madrid gathered their activists together to demand a fair energy transition, both here and across the planet. Murals created by participants represented the collective fight to demand renewable energies in the people’s hands and climate justice. The organisation itself paid tribute to the environmental defenders who, day to day, risk their lives for their communities. Only in 2016, 200 environmental activists were murdered for defending their communities and their surroundings. This is what happened to Berta Cáceres, the indigenous Lenca leader murdered in 2016 for opposing a mega-dam in Honduras. Voices supporting climate justice resonated in all actions at an international level. It’s no surprise that in only 2017 there have been various devastating weather phenomenon, such as droughts, hurricanes and flooding, as well as forest fires and iceberg detachments, boosted by climate change. The situation must now be considered a planetary emergency. Despite the planet’s critical situation, multinationals and governments worldwide continue investing in fossil fuels: 850 new coal plants are currently in planning or being built in 62 countries, while burning fossil fuels is the main cause of climate change. Some experts warn that the planet has about three years until the worst effects of climate change happen, which is why it’s essential to stop greenhouse gas emissions as soon as possible. Everything indicates that now’s the time to leave fossil fuels underground and support an energy system based on renewable energy sources and led by the people. Friends of the Earth is organising a huge global day of action on Saturday 14 October 2017, in which groups from across the entire federation are taking part, with decentralised actions worldwide. In Mallorca, we’re preparing a fun protest event where we’ll ask you to join us in speaking out against the abuse of power of the big energy firms and demand climate justice. Location: plot of land next to IES Aurora Picornell (C/ Barranquilla meeting C/ Bogotà, Llevant area, Palma). 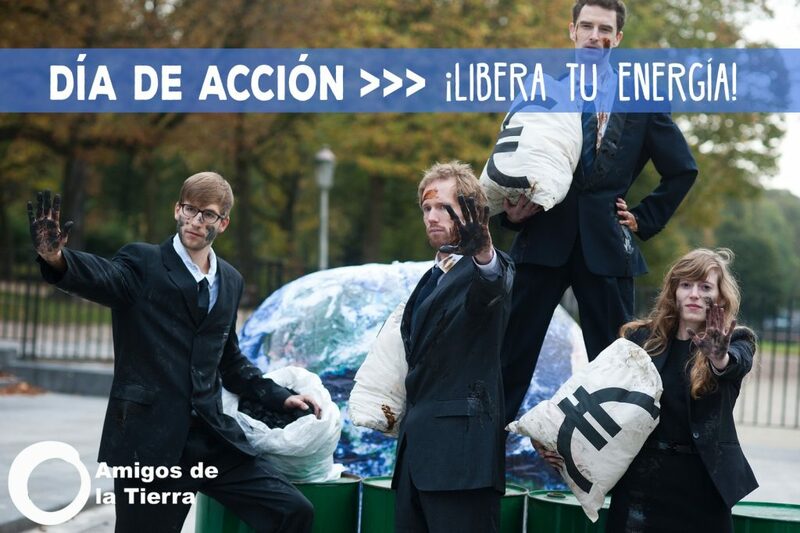 Download the ‘Free your energy!’ programme for sharing (Catalan only, PDF, 0.5MB). Join in and help out! We’re meeting to organise the activities so if you’d like to help (as well as taking part), send us an email using participacio@amicsdelaterra.org. Energy firms are destroying the lives of communities around the world, polluting our rivers, our land and our air. They’re speeding up climate change and hoarding land, ejecting entire communities and depriving them of their resources. But they won’t silence us; we can change this. We’re part of a global movement fighting alongside these communities to change the current energy model, using real solutions. We want to show that when we fight together, we’re even stronger. Do you want to join in with a global movement fighting for people and the planet to achieve energy and climate justice? Take part in the Friends of the Earth Day of Action! Free your energy! Friends of the Earth International brings together different organisations worldwide. We’re a horizontal, assembly-based movement where activists are our principal force for achieving energy and climate justice. 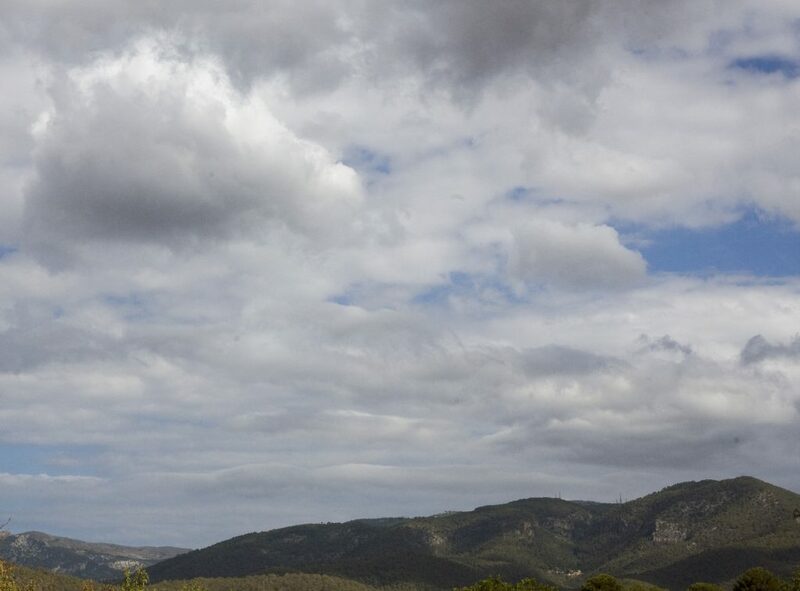 If you want to find out more about our work in this area, take a look at the climate and energy section on the Amigos de la Tierra website (Spanish) or the climate and energy section for Amics de la Terra Mallorca. 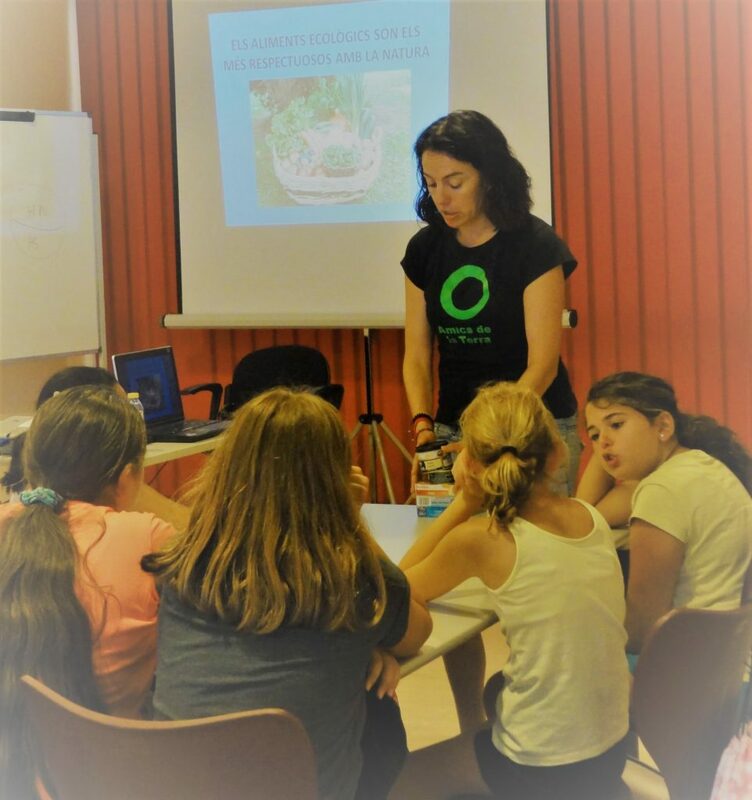 Amics de la Terra, with funding from the Caixa Colonya Guillem Cifre foundation, is offering free workshops about food to schools across Mallorca. There’s a limited number of workshops, which are designed for the second and third cycles of primary education. The deadline for carrying out the workshops is 15 December 2017. The activity starts in the classroom with everyone thinking about the relationship between our food and nature, and a very educational, visual explanation using PowerPoint and covering foods, the amount of food we’ll eat in our lifetime, the link between foods and nature, and the importance of having a healthy diet for our own health and that of the planet. the differences between natural and processed foods. After each exercise, we’ll talk about it as a group and, finally, agree the most important things that we have learnt and which eating and shopping habits we must change. The expiry of the effects of the first licence, requested at the time by Agua Mágica, means that Unibail-Rodamco probably can’t recover and carry out the first project of 22 buildings that was planned on the Ses Fontanelles wetlands. The Ses Fontanelles’ administrative document’s journey is long and complicated, and it still hasn’t come to an end. A few months ago, we celebrated the TSJIB’s verdict rejecting the appeal brought by the French multinational Unibail-Rodamco, developer of the Palma Springs shopping centre on Ses Fontanelles, which requested the decision to deny the commercial licence to be declared void and, in addition, the sentence to pay the trial’s costs. The Audiencia Nacional (National High Court) again agreed with the denial of the licence for a large commercial building, after which the National Commission on Markets and Competition (CNMC in Spanish), relying on the Ministry for the Economy and via Abogacía del Estado (the state legal office), also brought an appeal against the Balearic government for having denied the licence. This support for the arguments maintained by the Balearic government’s legal services, as much on the TSJIB’s part as the National High Court’s, has meant an important step towards the definitive protection of the last remaining wetland in Palma, although it’s not final. For its part, regarding the building licence, Palma City Council was processing two projects. The first one, presented initially many years ago by Agua Mágica, comprised 22 buildings plus underground and overground parking. This remained in limbo from the moment the new owner and developer, Unibail-Rodamco, presented a second proposal (known as Palma Springs). The council invalidated the licence at the time for having failed to meet a deadline for presenting documents. The developer has tried in recent months to revive the first of the licences. In this way, it’s told various neighbourhood associations that it intends to resume the original project. 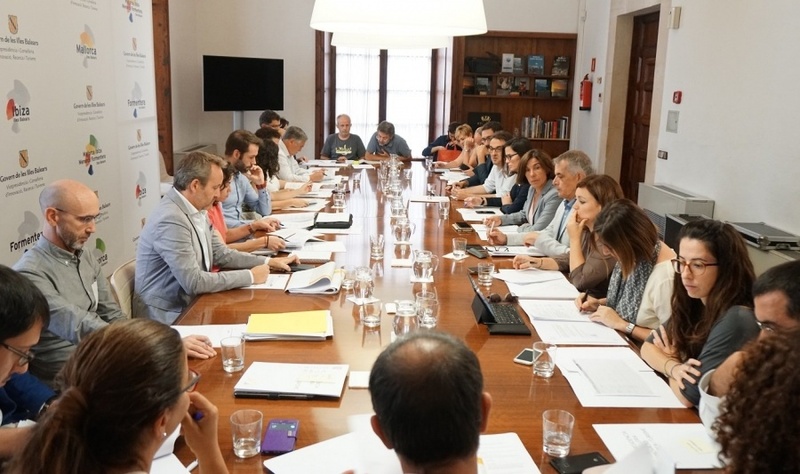 Today, however, Palma City Council’s town-planning management took to the management board’s meeting the declaration of the expiry of this same licence’s effects due to the application of the LOUS (Ley de ordenación y uso del suelo), which makes clear that after six months of inaction, a licence’s effects become void by operation of law. This fact, therefore, makes it impossible for the developer to recover the initial project, although it doesn’t make it impossible that once the building works (which have continued throughout the summer) are finished and the condition as a plot is achieved, the developer can present another one. So, Ses Fontanelles still isn’t saved, but firm steps have been taken to move towards the paradigm towards which the politicians who aim to look out for general interest must also move, and recuperate and protect this last wetland in Palma.